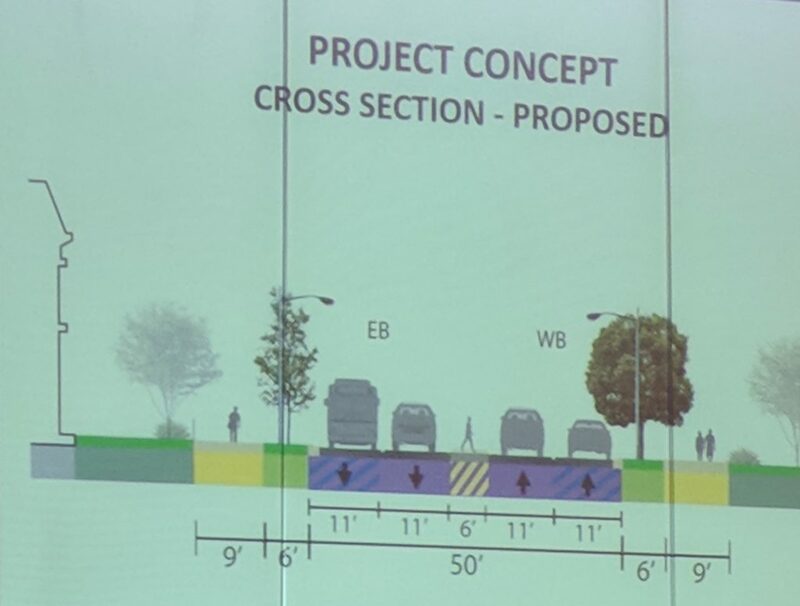 Last night (November 8), the District Department of Transportation (DDOT) presented plans to make Massachusetts Avenue NW “a safer corridor for vehicles and pedestrians”. DDOT showed Advisory Neighborhood Commission (ANC) 2B/Dupont that accidents occurred much more frequently in the project area – between Dupont Circle and Rock Creek Park – than normal. The frequency of rear end collisions and “side swipes” was especially high in the area, the presenters said. 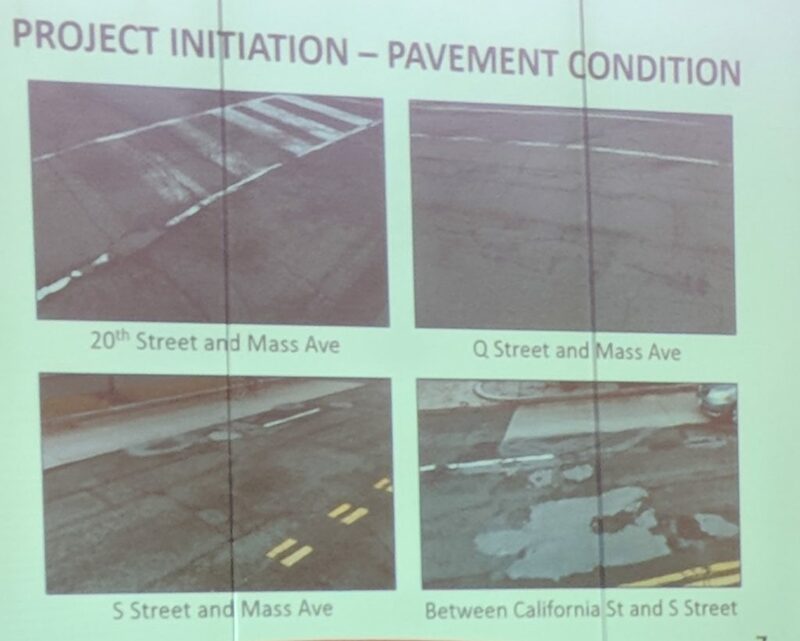 As a remedy, DDOT proposes to start with the condition of the pavement. ANC2B saw evidence that well over half of the area scored “poor” on a Pavement Condition Index. This section of Massachusetts Avenue often has uneven pavement and worn pedestrian crossings, in spite of the fact that it also hosts some of Washington’s most exclusive clubs and 34 embassies. The presenters also unveiled plans to reduce the width of the four traffic lanes in this area from 12.5 feet across to 11 feet. With the extra space, an unraised central pedestrian median, six feet wide, would be added. Commissioner Daniel Warwick (district 02) asked why there couldn’t been even narrower lanes and two-way protected bike lanes in the center. Commissioner Mike Silverstein (district 06) pointed out that this part of Massachusetts Avenue was the normal route of the Vice-President’s motorcade. The implication was that the Secret Service was likely to veto any plan that interfered with its ability to maneuver in traffic. ANC2B Chair Nicole McEntee (Commissioner for district 08) asked if there was any possibility to claw back any of the on-street parking in the project area that is now dedicated to diplomatic cars. The presenters implied that this would be difficult, as they are not actually allowed to have direct contact with foreign embassies – all negotiations would have to go through the State Department. 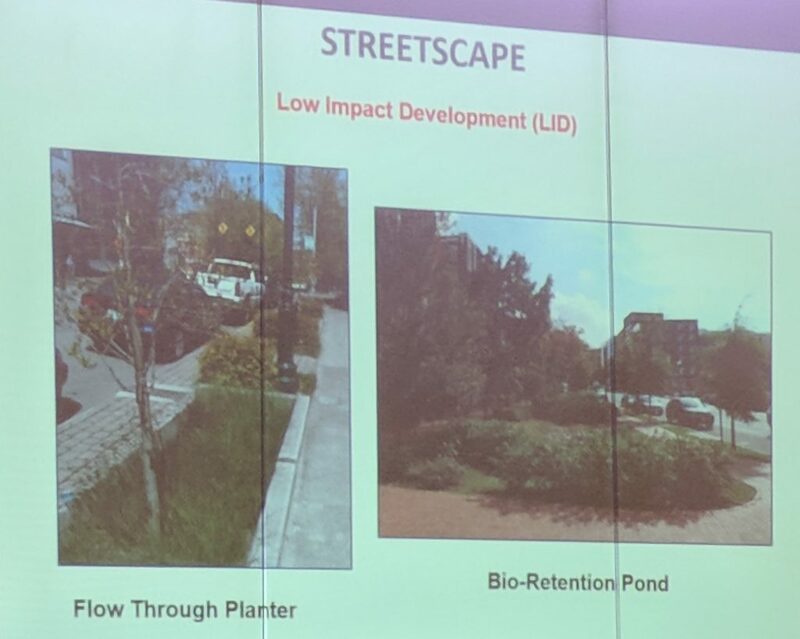 The presentation also showed design features, which included making wheelchair ramps ADA-compliant, replacing current “cobra-head” streetlights and coin parking meters, and constructing environmentally-friendly “bio-retention ponds” for water retention. Silverstein pointed out that ponds would be difficult to maintain in the long term, and might become an ideal habitat for the area’s ever-increasing rat population. Actual construction is not scheduled to begin until the first quarter of 2019, after two rounds of public meetings. Last night’s meeting was part of the first round. “The project is still at a very early stage,” DDOT presenter Huntae Kim said.